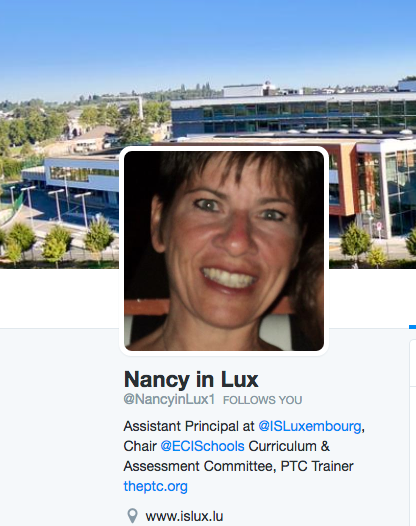 “Thank goodness for Twitter … would love to connect some students” was recently the tweet that I received from @NancyinLux1 This would be Nancy Lhoest Squicciarini, Assistant Principal at the International School of Luxembourg. We had crossed paths on Twitter and we are hoping to connect our student tech groups at The Student Tech Team Hub that the Mercy iWizards are developing. Folks are often surprised when I tell them that nearly all of my professional development as a school administrator is through Twitter. In the last month I booked speakers from Massachusetts, S. Korea, Canada, and Dubai to make virtual presentations at Mercy’s Tech Talk in February. I also did a podcast with an educator in Ottawa and had Google Hangouts with principals in Illinois and Jakarta. In each case my initial connection with these interesting educators was made through Twitter. For me, social media is most often intellectually stimulating, professionally gratifying, (and fun). I am pretty sure our Dean of Students and Athletic Director would not say the same thing. I work closely with both individuals and social media– particularly in the form of Twitter and Snapchat often lead to major hurt and headaches. In the “old days” a student might be mean to a peer or a parent rude to a coach. But on social media these remarks get shared and go viral. It is much harder to get past being stupid or inconsiderate when the messages or photos get seen by dozens or hundreds of others. When this happens, it’s awful…and guess what, social media is not going away soon. In fact it’s changing our world. So I am not naive about Twitter but I think we really need to consider as schools what obligations we have to instruct students about this form of communication. A one hour assembly every couple of years is probably not enough….but what is the best way? I’ll make sure that I will follow the best educators on Twitter who have something to say helpful to say about this important topic.